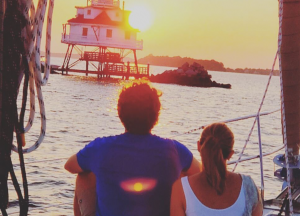 Daily Spectacular Maryland Sunsets & Full Moon Cruises! Allow our crew to take you to the best view in town. Bask in Maryland's spectacular sunsets or travel to a seemingly out-of-this-world magical experience on our full moonlight cruise for memories that will last a lifetime! 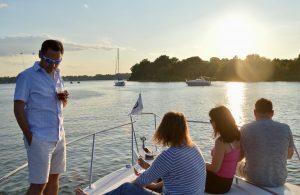 Daily romantic Sunset and monthly Full Moon cruises depart from Londontowne Marina to sail the South River and into Chesapeake Bay by Thomas Point Lighthouse. Cruises are approximately 3 hours duration (from 5:30 - 8:30 p.m.). We can accommodate up to 6 guests. Choose Therapy 43' sailboat sunset cruise Or Irie Vibes 34' powerboat sunset cruise. After a gorgeous sunset sail, many of our guests add a comfortable and private place to rest their heads and wake up to a delicious gourmet breakfast. Learn more about our Boat-and-Breakfast cruise package here.